It's time for a Spring Awakening! The Spring Equinox is one of my favourite times of the year because our energy levels start to rise again following a Winter lull. As a result of rising energy, now is the time to start taking action. The arrival of Spring is a great time to fill your calendar up, set goals, make commitments, and then make them happen. To wake up from your Winter slumber this week, and take advantage of your renewed vigor, follow the 7 poses and short flows I outline below. I have not used any props here, and while they aren't necessary you may want to have handy any props you typically use in your practice. 1. Savasana - Corpse pose typically comes as we finish our practice and celebrates an ending, but the ending also means a new beginning. It symbolizes waking from a deep slumber (the hibernation of Winter). Lay down onto your back. Extend the legs out in front of you and let your feet fall to the sides. Rest your arms down beside you, palms facing up. Take up some space on the floor. And closes your eyes. Take a few deep breaths here, and use this time to ask yourself what intentions you want to set for the season ahead. How are you going to use the renewed energy that comes along with Spring? After you have answered these questions, begin to awaken the body. Wiggle the fingers and toes. Reach the arms up to take a full body stretch, from the toes all the way to the fingertips. 2. Spinal Twist - While still laying on your back, pull your right knee in to the belly. Gently cross the right knee over towards the left. Open your right arm out to the side to help ground the right shoulder down. Take a big belly breath, feel the energy flowing all the way from your right arm to your right knee. Roll onto your back once more, keeping the knee drawing in. Catch hold of the big toe of right foot, and pull the knee down further in a half happy baby. Check in with your hip here to make sure you aren't overdoing it. Release the right leg down to the mat and slowly make the switch to the left leg. 3. Kneeling Flow - Come up to kneeling. 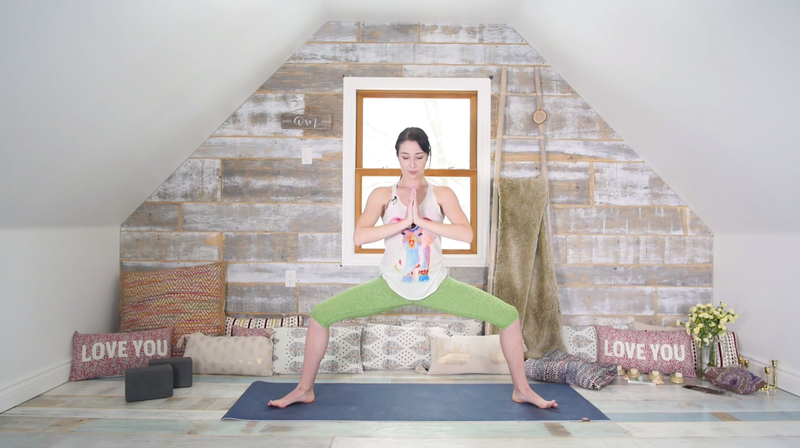 Untuck the toes, bringing the tops of the feet to the mat, and sit back on your heels. With an inhale, come up on to your shins, and reach your arms up over head. With your exhale, sit back on to the heels and swipe the hands down to the ground behind you. Inhale, pushing into the hands and expanding the chest open. Exhale, folding forward and resting the arms and head down into a child's pose. This cycle takes you into an opening, following it with contracting, similar to the process of a seed blooming. Repeat this cycle 5 times. When you come to the last child's pose, stay here for a few breaths. 4. Sun Salutation - Move into your first downward dog. Pedal the feet out, then walk forward to meet your hands at the front of the mat. Bend your knees generously to roll all the way up to standing. Take three half sun salutations here to warm up. Make sure the feet are about hip width apart, grounding down through all four corners of the feet. Inhale the arms up, bringing the palms together to touch. Exhale, folding forward, and bending the knees as needed. Relax the arms and head down. Inhale, bringing hands to your shins and coming to a half lift with flat back. Exhale, folding all the way down. Inhale to rise up, leading with the arms, and bringing them to touch. Exhale the hands down the midline to the heart. Take 2 more. 5. High Lunge - Take a vinyasa flow, before returning to downward dog. Kick the right leg up, then step it through to the front of your mat. Scoop the tailbone as you lift the hands up overhead, turning the palms toward one another. Bend generously into your front knee. Sweep the hands down and behind you, interlacing the fingers. Squeeze your shoulder blades together and lift the thumbs away from you as you take your gaze upwards. Exhale to fold forward over the front leg. Keep the generous bend in the front knee as you reach your arms upwards. Inhale and bring the hands to your heart as the chest lifts. 6. Chair to Warrior 3 - Step the left foot forward to meet the right. Bend deeply in to both knees, while keeping your chest lifted. Incorporate lion's breath into your chair pose for additional energy. Inhale, floating the arms up overhead. Exhale, folding forward towards your knees as the arms sweep down and back. For your exhale, open the mouth and stick out the tongue. Repeat this cycle 5 times through. In your final exhale fold, interlace the fingers behind you and lift the arms away from your back. Straighten the legs, and let the head relax down in a full forward fold. Bend the knees and start to lift chin and chest parallel to the floor. Keep squeezing the shoulder blades together. Lean on to the right leg, as you extend the left leg back behind you. Keep the left hip from opening up to the side. Deepen your breath as you try to balance here, finding a renewed energy and vitality. Repeat 5 and 6 through on the other side before moving on. 7. Goddess to Triangle - Turn to face the long edge of the mat and take the legs wide. Turn the toes out to about 45 degrees. Inhale, reaching the arms up and bringing them to touch. Exhale, drawing the hands down the midline and bending the knees. Repeat through 3 cycles of this. On the last cycle, linger in goddess. Invite the knees to widen, using your hands as needed to guide this process along. After a decent hold here, straighten the legs. Point the right toes forward to front of the mat, and turn left toes in to the side edge of mat. Reach the arms out over the legs. Lean the left hip back as you slide the right hand down the right leg. Reach the left arm up to the sky, rolling the top shoulder back for a nice opening in the chest. Feel into all of the space you have created here. Inhale slowly to come up, and then flip the feet to take triangle to the left side. 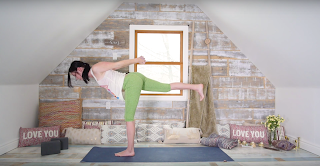 If you feel like you are just getting started with your Spring awakening, click through to the video below for more from my Spring Equinox Blossoming Yoga Flow. This is the third in my seasonal series of videos. Look back at the Fall or Winter practices. And be sure to look forward to a Summer video when the time comes!